Der NYX Rouge à Lèvres Matte - Whipped caviar ist der perfekte kleine Lippenschmeichler. Sein mattes Finish und seine cremige Textur verleihen den Lippen sofort einen vollere Erscheinung. Ich mag matte Lippenstifte zur Zeit am allerliebsten. Zudem passt das Matt auch hervorragend in die Herbst und Winterzeit. Gloss und Glitzer passen besser zu Frühling oder Herbst. Dieser NYX ist mein erster dieser Marke. Vorrangig finden sich bei mir P2 oder Maybelline in meinem Schminktäschchen ein, weil mich der Preis und vor allem die Qualität überzeugen. Aber vom der Qualität her, würde ich sogar sagen, das der NYX der beste ist, den ich nun besitze. Durch seine Cremigkeit verschmilzt er perfekt mit den Lippen und hinterlässt keine Ribbel oder setzt sich gar in den Fältchen ab. Haltbarkeit ist auch top, nach 4 h mache ich allerdings eine neue Schicht drauf. Fazit: Mein neuer Wegbegleiter. Die Farbe passt perfekt zu meinem hellen Teint und sieht immer edel und luxoriös aus. Für ca. 8,- EUR ist er im Douglas Onlineshop oder einen ähnlichen bei iparfümerie zu haben, meiner Meinung nach jeden Cent wert. Da er mich so überzeugt hat, werde ich mich auch noch nach weiteren Farben dieser Marke umsehen. Danke an Sandri, für diesen tollen Lippenstift! The NYX Rouge à Lèvres matte - Whipped caviar is the perfect little lip flatterer. Its matte finish and its creamy texture give the lips a fuller appearance immediately. I like matte lipsticks most, right now. In addition, the matte also fits well into autumn and winter time. The glossy and glitter thing fits better to spring or fall. This is my first NYX. You`ll Primarily find P2 or Maybelline in my make-up case, because they got me with the price and especially with quality. But by the quality of this NYX, is the best I own now. With its creaminess it melts perfectly on the lips and it will not sit down into the wrinkles. Durability is also great, but after 4 hours I refresh it. Result: My new companion. The color goes perfectly with my fair skintone and always looks elegant and luxury. Price: aprox. 8, - EUR in Douglas online shop, in my opinion, worth it every penny. Now I'll look for more colors of this brand. Thanks to Sandri, for this great lipstick! Die Farbe gefällt mir total gut. I'm super obsessed with Kylie Jenner's transformation--and of course her lips are what everyone is talking about! It's funny--I was totally looking at this lipstick on the NYX website right before I read this! Super pretty! It looks gorgeous on you. I like a matte lipsticks. Thanks for your visit and comment. Great blog. I am following you now on GFC. I'll be very grateful if you follow back. That we can keep in touch! I really like the color of lipstick! I like these products so much!! I love Nyx! That color is beyond beautiful, I love it. 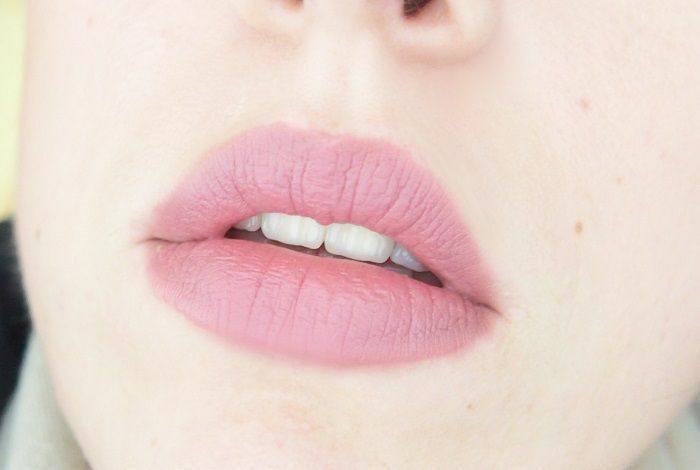 This is a lovely colour - something I should def try out because it's not too over powering. Such a gorgeous color. I love one very similar to that it's Kate Moss Rimmel 107.
very pretty color shade and i love the softness of it. I fell in love in this color! Wow! You're beautiful! That color is beyond gorgeous!!! Great review. I've never tried their products but it's good to know their lipsticks have staying power! Lovely post, thanks for the tips, I loved them so much! I invited you to my blog! Its very nice color lipstick!